A family trip involving several generations can lead to precious memories -- if you can organize one without killing your relatives first. Here are some pointers from a pro. This past February, 13 members of my extended family flew to a coastal property in Jamaica and spent the week lounging on the pearly white sands outside of Ocho Rios. We left the resort to walk hand-in-hand through the tumbling water of Dunn’s River Falls, visit the boyhood home of Bob Marley, and partake in everyone’s favorite jaunt, tubing down the mountainous White River while peering out at the green mosaic of ferns, banana trees, and bamboo. The group included my 79-year-old dad and his wife, the baby boomer contingent of me, my siblings, and their significant others, and four children ages 10 to 13. Whether it’s guilt, guilty pleasure, or even a genuine yearning to be with your extended family, here’s a primer to get you started. Name Your Leader According to Underwood, the boomer generation tends to organize the trip. (If you’re a boomer and happen to be a travel writer, like myself, you’ll be organizing family trips for the rest of your life.) First, find a date that works for everyone. For parents of school-aged children, that usually means over the summer or during spring break, which are the most expensive times to travel and will not please your brother, Jim, who has no children and would be happy to travel the second week of January. Next, figure out which location works best for all ages. First and foremost are the children, since a bored and needy child ruins the trip for everyone -- the reason why the Disney theme parks remain so popular for family get-togethers. That is, unless you have a brother and stepbrother who have no children and consider theme parks with thousands of screaming kids the equivalent of Dante’s Inferno. Then you should look at all-inclusive resorts and cruises. Yesawich notes that bundled vacations work well for togethering, since people know the cost of their room and board before they go. Large house rentals are another viable option, though one my family tends to avoid, since it’s a little too close for comfort. Don’t be overly ambitious by, say, trying to schedule a road trip up the coast of California or a safari in Africa (unless you’re picking up the tab). Extended families tend to want to stay in one locale and to like affordability. Once the date and place are confirmed, be sure to book the flight well in advance to get reasonable rates, and then start working on daily activities. Disney World has set up Magical Gatherings, a website application where everyone in your group can collaborate on the itinerary. This works well for family members who once lived on communes, where opinions are valued, but over the years I learned that a dictatorial approach works better than waiting weeks to arrive at a decision as trivial as where to eat lunch on Tuesday. Cruises and all-inclusive resorts also feature activities online, so you can pick and choose before you leave. If you’re booking a house or hotel room where food is not included, make dinner reservations once you arrive. On a trip to the Sonesta Key Biscayne, near Miami, to celebrate my dad’s 75th birthday, we befriended a bartender down by the pool who told us where to eat each night. His recommendations were spot on, and by the end of the trip, it felt like he was a member of the family. Look for Memorable Trips For cruises, my dad and his wife love Holland America for the live music and entertainment (http://hollandamerica.com), my wife and I prefer Princess Cruises for the spacious berths and top-notch food (http://princess.com), and my children’s first choice is Royal Caribbean for the rock-climbing walls, onboard surfing, and other kid-friendly fare (http://royalcaribbean.com). My family’s best cruise award goes to Alaska’s inside passage aboard Holland America. We’ve been to more than 20 all-inclusive resorts. Our favorite multi-generational stay was at the Riu Ocho Rios in Jamaica (you can find it at http://riu.com/en-us/Paises/jamaica/), followed by the Iberostar Bavaro in Punta Cana, Dominican Republic (go to iberostar.com). If you’re planning to rent a home, Yesawich recommends the Outer Banks of North Carolina, where there is a large selection of houses with five or more bedrooms. Consult DiscoverVacationHomes.com for a listing of vacation rental companies across North America. The Magical Gatherings program at Disney also offers VIP dinners at Epcot, a separate payment plan so there’s no problem splitting the check, even the use of two-way radios to find one another on the property (http://disneyworld.disney.go.com/). If you’re really trying to keep it affordable, book a group campsite at one of the state or national parks. Group sites at the Seawall Campground in Acadia National Park (http://nps.gov/acad/planyourvisit/groupcamping.htm) are nestled in the woods and are only a 10-minute walk to the tidal pools that hug the Atlantic shoreline. Don’t Expect Perfection On that same trip to Jamaica where we were floating down the river singing “No Woman, No Cry,” my stepmother complained about her room with lack of ocean view and my sister didn’t want to fork over a hundred dollars for a massage. Since I was the one who set up the trip, they expressed their displeasure to me. So I found my dad and stepmom a new room, and, for my sister, just outside the property, I discovered a local masseuse who was charging a mere $40 an hour inside her makeshift hut (we loved her so much that all nine adults visited her during our stay). At the end of the week, I received a huge hug from everyone and a pat on the back with the statement “Excellent job, Steve, once again.” Yeah, right, in my dreams. This is family, after all. Stephen Jermanok, a frequent contributor to the Globe Magazine, blogs at ActiveTravels.com. 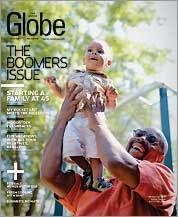 Send comments to magazine@globe.com. 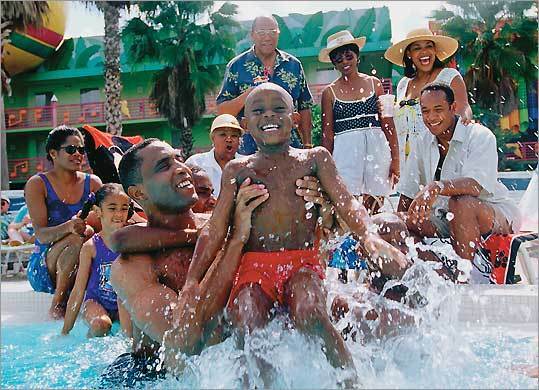 Discuss Have tips on organizing large family trips?